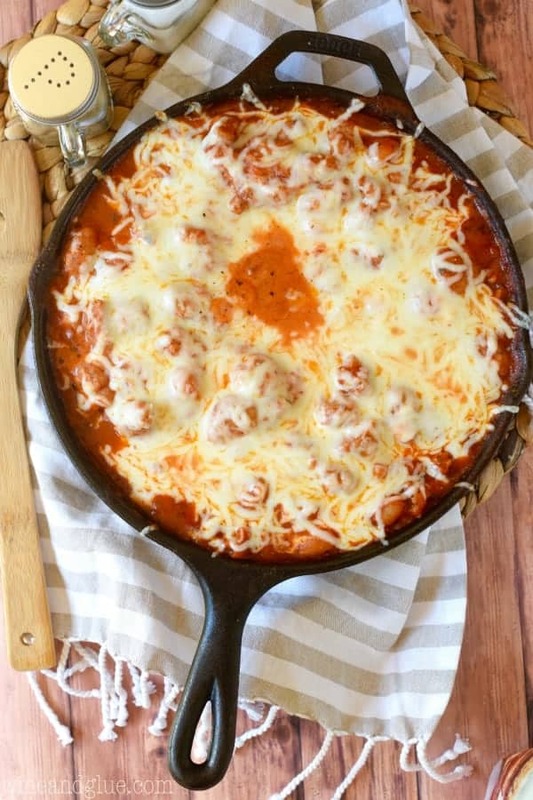 This Lightened Up Skillet Lasagna is ready in under 30 minutes, made from scratch, and is INSANELY good! Thank you Jennie-O for sponsoring this amazing and delicious dinner! If you’ve been keeping up with the blog lately, you know that I’m riding a roller coaster of emotion related to my kids going back to school. One minute I am stepping on Legos and counting the minutes until they are gone and the next I’m squishing their faces and wondering where our summer went. Picking up the 1,843 sock of the day . . . . . crying over a painting Quinn made of her and I holding hands. Breaking up the 896 fight of the day . . . . getting kicked in the feels from the best hug ever. So whether I’m ready . . . or SO READY . . . or not, the school year is coming. It’s breathing down my neck. And with it will be that hour of insanity from when we start homework to when dinner needs to be on the table. 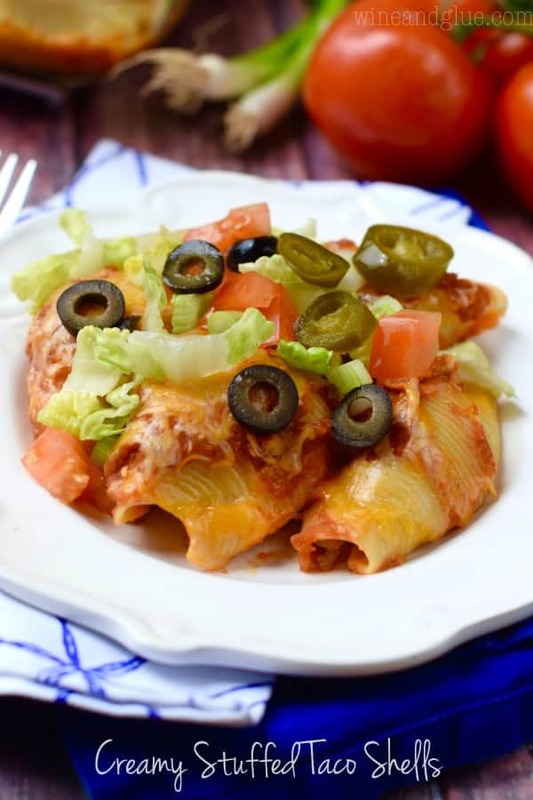 I’m arming myself with dinners that are delicious, easy to make, and FAST. 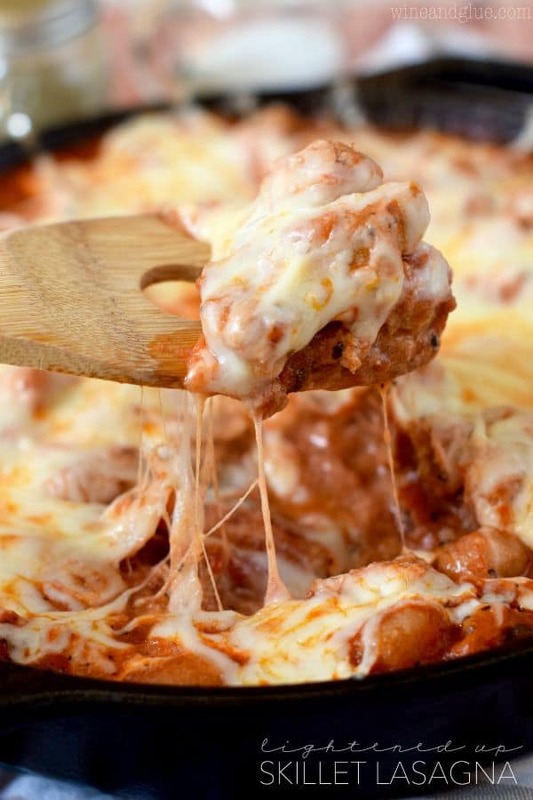 And this Lightened Up Skillet Lasagna totally falls in that category. 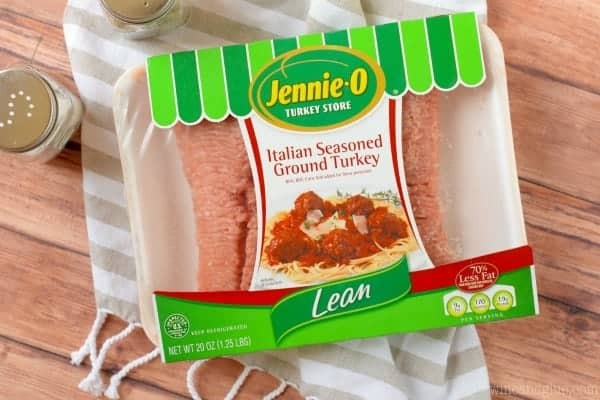 It starts with Jennie-O’s Italian Seasoned Ground Turkey. If you’ve been around Wine and Glue for even a month or two, you know that I have a huge crush on Jennie-O. I always have some in the fridge and it is the foundation for some of our favorite dinners, like this soup and these meatballs and OMG this risotto (<—– my favorite dinner ever!!). 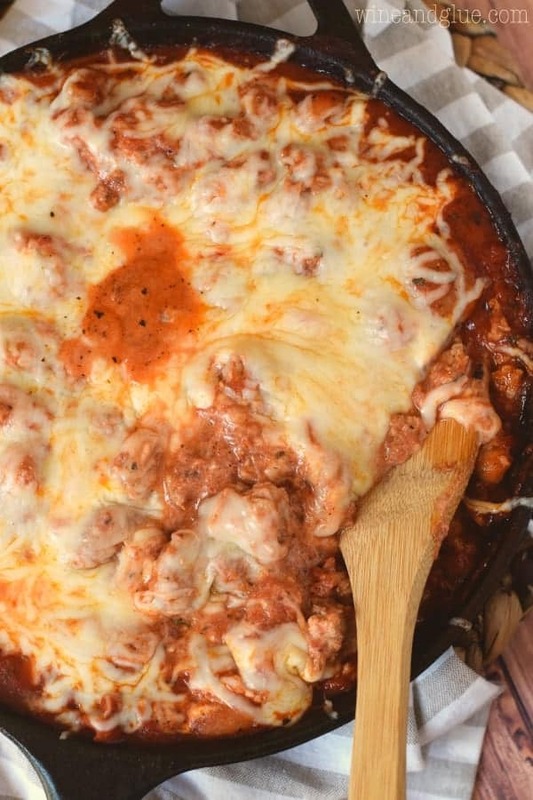 You definitely want this Lightened Up Skillet Lasagna to be part of your regular dinner rotation. It’s made with sweet potato gnocchi, but if you can’t find those, sub in some whole wheat lasagna noodles broken up. 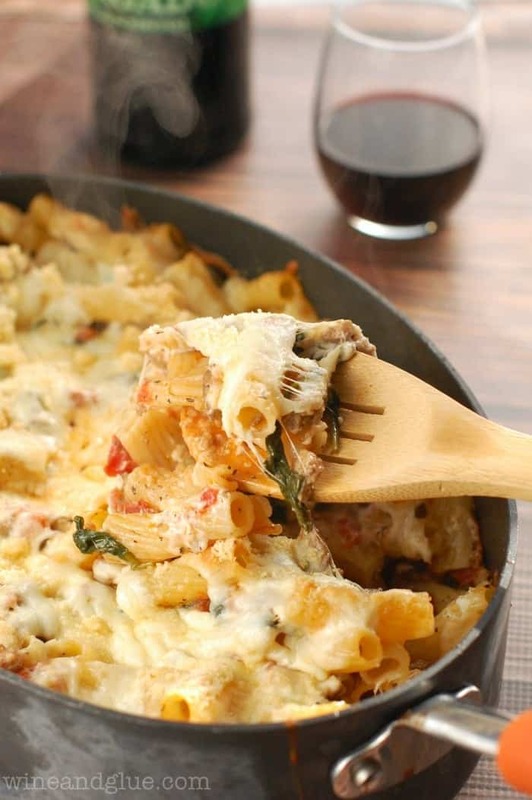 It also uses some low fat ricotta cheese and low fat shredded mozzarella. When you combine those with the Jennie-O turkey meat, you have a dish that is just about 400 calories but not at all short on flavor. Plus it comes together in less than 30 minutes and makes your house smell amazing! Dinner win, y’all! Can I pull off y’all? Make sure you follow Jennie-O on Instagram, Twitter, and Pinterest and check out their site for more delicious Italian inspired recipes! Heat the olive oil in a large oven proof skillet over medium heat. Add the garlic and cook for about 30 seconds before adding the turkey. Cook, breaking up the turkey meat until it is no longer pink. Add the gnocchi, and cover. Cook for about five minutes or until the gnocchi is cooked through. Stir in the ricotta cheese, top with the shredded mozzarella and put it in the oven uncovered until the mozzarella is completely melted, about five minutes. Thank goodness for my readers! I swear, I miss ingredients and steps more than is okay for a food blogger! Okay, it is updated with 16 oz of sweet potato gnocchi. I could only find potato gnocchi. Will that still be good? Hi Amy! The regular potato gnocchi will still be great! Oh this is so being added once I have a stove again. I love that turkey! Where can I buy the sweet potato gnocchi? Hi Lindy, I found mine in my supermarket next to the regular gnocchi, but I know not all supermarkets carry it. If you can’t find it, I would just use whole wheat pasta or lasagna noodles broken up.